Below are some suggestions to check and fix possible audio related problems. Just try whichever are applicable or you haven’t tried yet. 1. Double-check if your microphone/s and speaker/s are properly plugged-in, active, or turned on. Be sure that they are also not muted. You can also test them using other applications to make sure that they are working and not defective. 2. 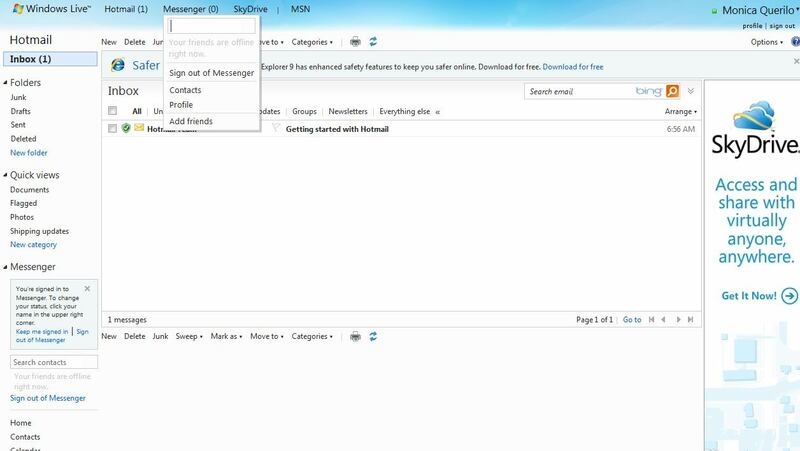 Download and install the most recent version of Skype. Issues, bugs, problems, and irregularities in older versions are often fixed or solved in the latest Skype version. 3. Update your audio/microphone/webcam drivers. You can use the Update Device Drivers function of your operating system, or visit the corresponding manufacturers’ site to check if there are new versions of drivers for your devices. 4. Download and Install remaining updates for your Operating System. 5. Then click Tools >> Options >> General Audio Settings. Under Microphone, select the preferred microphone device that you want to use (there could be one or more options available when you click the dropdown selection arrow). Check if the Volume Meter will respond when you make sounds. You can also try to uncheck Automatically Adjust Microphone Settings and manually Adjust the volume to 80%-90% full. Under Speakers, select the preferred speaker/headphone device that you want to use (there could be one or more options available when you click the dropdown selection arrow). To test you speaker/headphone, click the check speakers option (green play icon) and check if the Volume Meter will also respond. You can also click the Show Advanced Options to change the order of preference of the available microphone and speaker devices in your computer. For example; you place your external microphone on the top of the list, followed by your internal microphone. Skype will first look for your external mic, and will only use the internal mic of the external mic is not available or not plugged-in. This should work on Microsoft Windows Vista, Windows 7 , Windows 8 , Windows 8.1 Blue but probably it will work on Windows XP too. Thank you for your suggestions. I apparently have an unusual problem. I hear the normal sound when skype come on. I also checked speakers and the volumn meter responded. I went to sounds and the sounds played. However, when I tried a test call I could hear nothing. Any other suggestions?? Do you have all Windows updates and updates to your system and any hardware devices by the manufacturers? I re-installed Skype but still no audio on Echo 123, re-checked the audio settings and it was set to independent headphones, don't know how that happened, selected speakers & headphones and all is well again. So simple!! I set my Uncle up on Skype. Did Microphone test and all Ok. When he calls I can see him with his external camera, but can't hear him, although I have checked and the sound monitor is moving up and down on the scale. What can I do. My problem is that my correspondent cannot hear me. All is working perfectly for audio settings. I was calling to the Seychelles Islands and I was able to hear my correspondent but he/she could not hear me. What's the problem ?! I assume you did Echo sound test and everything worked fine. 1. Please make sure your correspondent did the same and everything's OK.
Hi! Have a strange audio problem with Skype. Everything is in order, but when I call someone or someone calls me, I can't hear the other person. The other person can hear me. The same applies to Echo / Sound Test Service, I cannot hear the service's voice. However, there is one way of making it possible to hear the other person or the voice of Echo / Sound Test Service. That is, having Skype Options > Audio Settings GUI open. When this graphical user interface window is open, only then everything works as should! My platform is Win 7 Ultimate 64-bit. It would appear there is a bug in Skype (6.0.0.126). Skype developers, please help. That is, having Skype Options > Audio Settings GUI open before and during the start of the call. Checkplease what Audio source is hoghlighted, is it one that you're using by default? Before closing these settings GUI, Save all. Third, open ControlPanel - Sound devices and make sure your sound device is set to default. Thanks the attempt to help. Have done all the things you suggest, unluckily without help. Have also uninstalled Skype, deleted the contents of the %appdata%\skype directory, and removed all (Skype) entries from the registry. Then have clean installed the latest Skype version. All that has not helped. Suspect there is a bug in the program code of Skype. So far, the only way to circumvent the problem is to open Skype Options > Audio Settings and have it open during the start of the call. Am working with Skype Customer Service in order to solve the issue. Honestly, that's strange. First time I am encountering such problem - I've got experience when Win lose audio due to different connections - like HD through HDMI cable or BT - for some (Win) reasons it switches focus on different channels/devices on its own, but, not like this. Please share your (and Skype's tech people) findings when you get it solved. I'm having audio problems with Skype, I hope someone can help me. I have a headset w/microphone that I use, as my computer has no speakers. I use this headset to listen to music, play games and Skype. However, I have a strange problem with it. When playing games, I hear music, but my microphone doesn't work. When Skyping, my friends can hear me, but I can't hear them. I checked my sound options, and I can't hear anything in the test call, not when I test the volume under Tools>Options>Audio. I have the latest version of Skype, all the latest Windows updates, and Windows 7 Professional 64-bit. Any assistance would be greatly appreciated, thank you. Have you tried to open Tools>Options>Audio Settings before you make the test call, and leave it open during the call? That is how I can circumvent the problem. When I do that, then I can hear the other person or the voice of Echo / Test Call Service. Similarly I can hear any other person that calls me, if I open Tools>Options>Audio Settings before I answer the call and leave it open during the call. The same applies, if I call someone. If I open Tools>Options>Audio Settings before I call and leave it open during the call, I can hear the other person. Have you tried whether this procedure helps you? If not, please, give it a try. In order to solve the problem, Skype developers are doing technical analysis on the data I have sent them on request by a Skype Customer Service Specialist. Hope they are able to find the cause for this annoying issue and that they will to fix it in a future release of Skype. In the meanwhile I keep doing what I described above, which helps circumventing the problem. I also have the latest version of Skype (6.0.0.126) installed, and my platform is Win 7 Ultimate 64-bit. Please, kindly let me know if the procedure described helps you too. My daughter (Vancouver, BC) and I (Reno, NV) are new Skype customers. We have both registered and have successfully attached and configured our mic/camera devices to our computers. There is another existing Skype customer in the form of another daughter in Sacramento, CA. Here's the "rub". 1) All three of us can hit the Skype "test function" which connects you to the lady with the British sounding voice, allows you to say a few words, and plays those words back to you. We three are completely successful with this test - loud and clear. 2) I can call my daughter in Sac and have a perfect call, audio and video, in both directions. 3) My daughter in Sac I can call me and have a perfect call, audio and video, in both directions. 4) If either of us calls the daughter in Vancouver, the video connection works perfectly, the Vancouver daughter can hear the one calling perfectly, but the calling party cannot hear the Vancouver daughter (unless we make a land line telephone call at the same time). Remember that when she uses the Skype test to the British lady, she hears her speach returned perfectly to her. Help to fix this problem would be greatly appreciated. When I talk to a person I hear sounds from his PC(windows,games,etc.) even if his mic is off. Is there any way that can be turned off because he is not hearing sounds from my PC? I have a Lenovo tower connected to an Insignia LCD TV. I have a Logitech webcam HD 720p that connects to the tower. Whenever I call someone there is a tramendous amount af feedback on their end only. I've called Logitech, talked to Best Buy, looked online, tried everything suggested, but it just won't clear up. I only have the internet to use for my telephone, so what can I do to fix this problem, please? Go to Tools -> Options -> Audio settings. Uncheck the option "Automatically adjust microphone settings". Also try to reduce the Microphone volume and make sure that your speakers are no too close to the microphone. Answer was right in front of us. Your computer, via the "control panel" has many setup functions including those for audio. We had correctly adjusted all of those. The "Skype window" has setup functions including those for audio. These had not been correctly set. The Skype Echo Sound Test Service will yield a positive response even if the Skype audio controls have not yet been correctly positioned. I basically have a similar problem to everyone here. I recntly updated skype on both my windows 7 and xp laptops. For some reason, I can't hear anything from the caller even though they can hear me very well. Funnily, it works fine on the xp laptop. On the top edge click on the CALL button. New window opens with your settings for MIC and SPEAKER. Set these drop downs accordingly. Report back and let us know if it works, it did for me. Is your platform a 64-bit Windows 7? Have you tried to open Tools>Options>Audio Settings before you make the test call, and leave it (the GUI) open during the call? That is how I can circumvent the problem. When I do that, then I can hear the other person or the voice of Echo / Test Call Service. Similarly I can hear any other person that calls me, if I open Tools>Options>Audio Settings before I answer the call and leave it (the GUI) open during the call. Thanks for that! Once I did that it worked fine!! I'm currently having problems with the audio in Skype. I recently got new harddrives that were installed into my computer and after installing Win7 pro x64 and all other drivers I installed Skype. The problem is that there's no sound effects at all with Skype, whether I use the headphones or speakers I still can't hear the sound from login, log out, new messages or the call sound if someone calls. Though it should be noted that if I'm in a conversation the other party can hear me and I can hear them so it's just the sounds effects that aren't working, also all other sounds works, music, youtube, windows sounds etc it's just skype that doesn't work. It used to work with the same version of W7 etc, the only thing that's different is that it's on my SDD now. I've uninstalled - cleared the register - removed %appdata% - restarted - reinstalled several times. Checked for updates for my drivers, checked all options in teh dropdown menu I could pick for outgoing sound in skype sound options, tried older and the newest version of skype. Also checked that the sounds aren't muted and tried reseting the settings in the preference, notification and made sure I'm online. Gone through the troubleshooting options and now I don't know what else to try so hope someone can help me. First make sure that your connection status is not set to "Do not disturb". In Skype go to Tools -> Options -> Sounds. Can you hear any sound when you press the "Play this sound" button? Is the text on the button just below the test button saying "Mute all sounds"? Be aware that if the text is "Enable all sounds", then the sounds are actually muted. What do you have selected for "Ringing" in Tools -> Options -> Audio settings? Yes I've made sure my connection status was set as "Online" and not "Do not disturb". No I can't hear any sound when I press the "Play this sound" button. If I press the button in the sound settings the meter won't move. Yes I've made sure that the sound isn't muted. I got all the standard sounds picked in the list, so it's just Skype, ringing (modern). It's in Swedish though so the translation I did might be wrong. What device have you selected for "Ringing" in Tools -> Options -> Audio settings? Have you tried with other selections? If you mean which device I got for the outgoing sound then the speakers and yes I've tried all the other devices I can pick for outgoing sound. 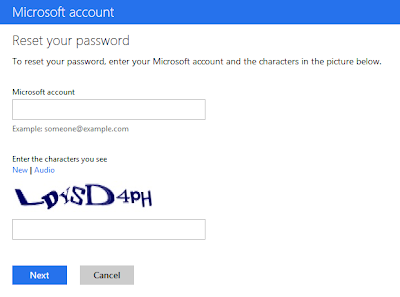 When you lost your password, or your forgot it, or someone gets your password , or someone hacked your hotmail or outlook, or Windows Live Messenger account or MSN you should reset it. Click "Can't access your account?". 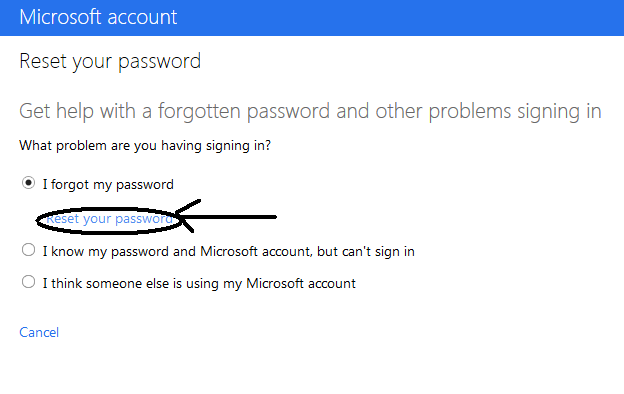 When new page is opened, click "I forgot password", and then click "Reset your password". 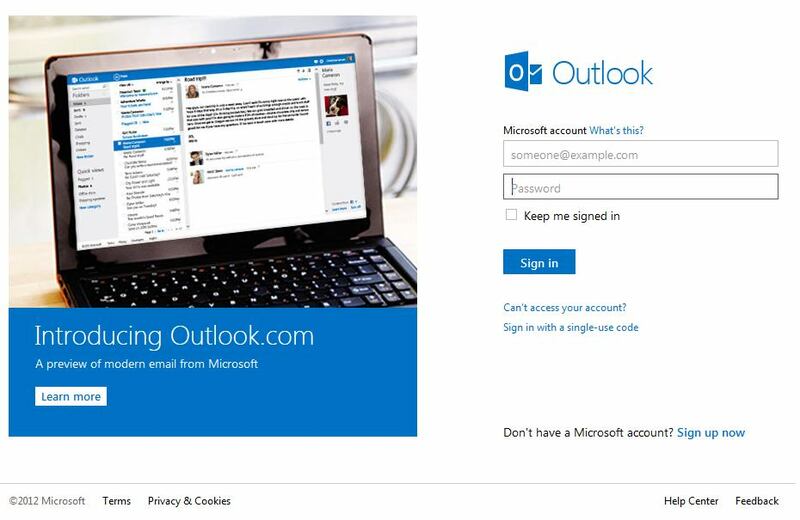 Then in the next page enter name of your hotmail, outlook, Microsoft Windows Live account or MSN account or email. When you click "Next", you must open your alternate address which you entered on creating email. 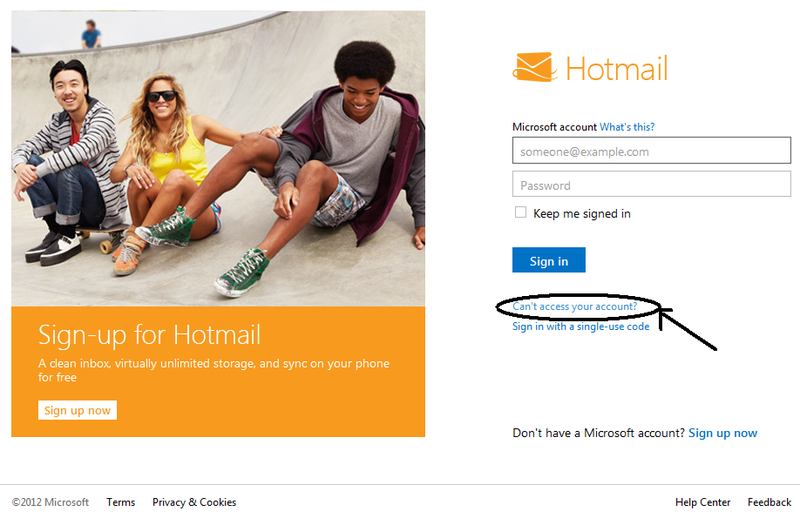 Microsoft hotmail will send link for reset on your alternative email and when you click on it you will be able to reset password and enter new password. So next time take attention on alternate email address. This is best way to retrive and recovery password. If you want to use Windows Live Messenger MSN to chat and comunicate with your friends you need to have hotmail email account or outlook acount or other mail account which is signet by .net passport. 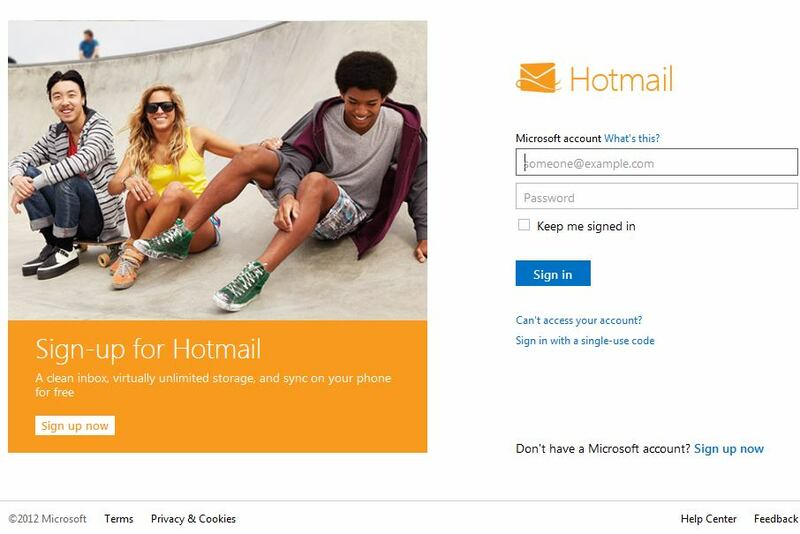 We will teach you now hot to create hotmail account and outlook account. Outlook account is new feature from Microsoft and it is suposed to be used with new Windows 8 operating system. First, open the web page www.hotmail.com . Click "Sign Up Now" and you will be forwarded to form on which you must enter informations about yourself. Also you must choose name of your mail that is not already used. 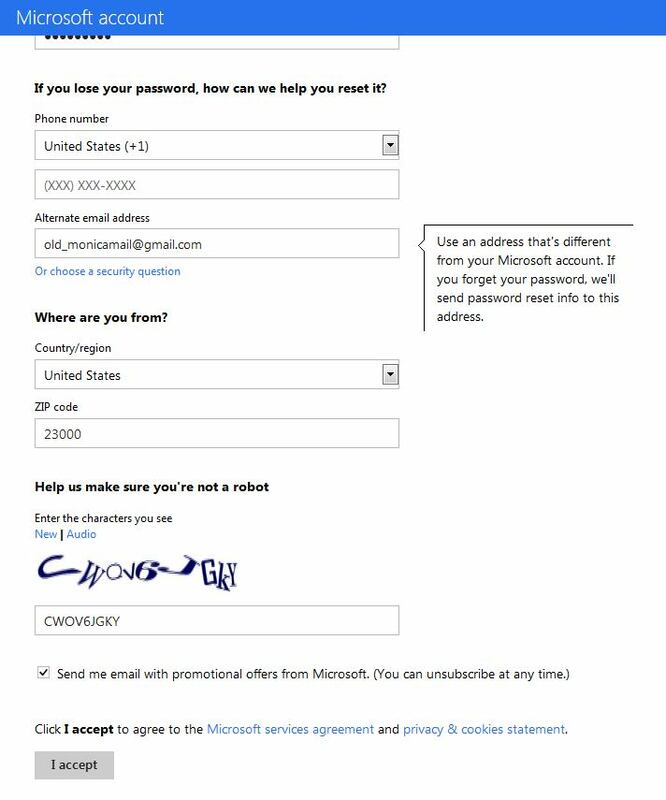 You must enter complicated password to be able to sign in to hotmail Windows Live Messenger MSN account. 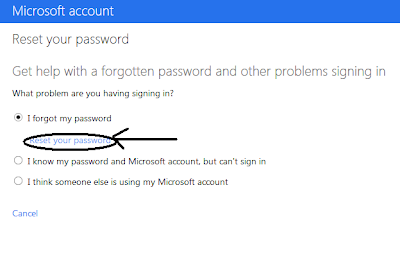 Alternate email address is very importat because when you fogot your password or someone hack yor Hotmail Windows Live Messenger MSN account you can allways get your password by clicking "Forget Password" and your new password will be able to reset by your alternate email address. After you entered all information you have to click "I Accept". Then Hotmail asks you if you want to use HTTPS. We recommend you to use it. 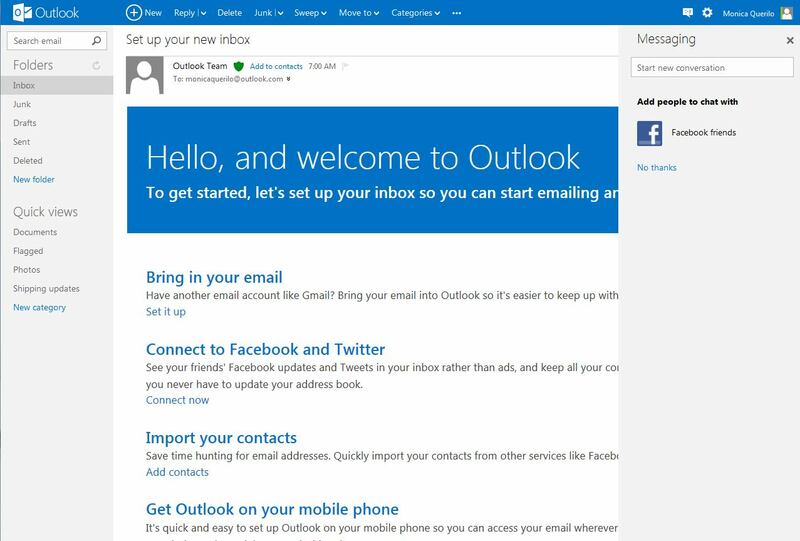 And you have your Hotmail email account with your imbox, Windows Live Meessenger MSN, SkyDrive, MSn and lots more. You are online on MSN Messenger by default and you can sign out by clicking on Messenger , and then on Sign out Messenger. 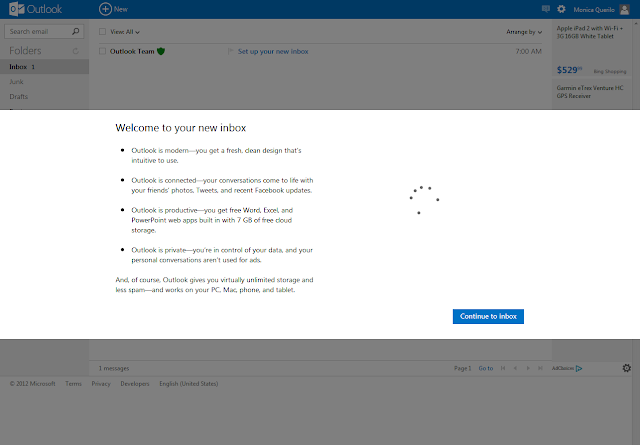 Now if you want to signing in to Microsoft OUTLOOK email account which also can connect to Windows Live Messenger and MSN, and you will have Windows Messenger ID. This is also a short review of outlook email online client. Then click "Sign up now" in bottom left corner. Enter your First Name, Last Name.Birt date. 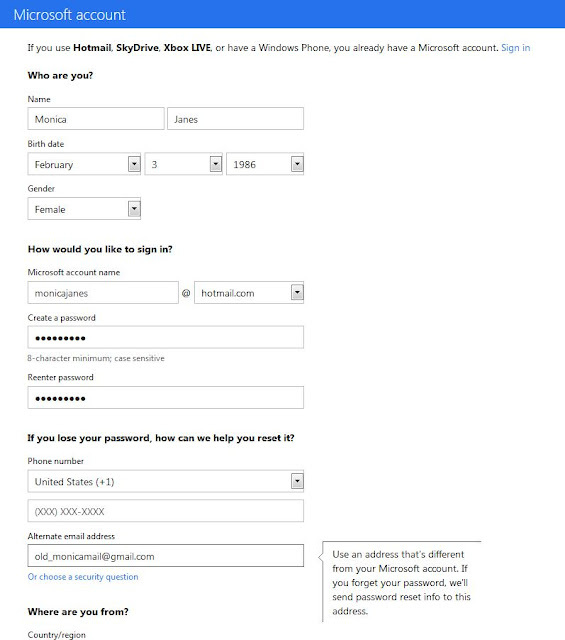 gender , Microsoft account name - you must take attention to account name because everybody will use that name to contact you, also you must choose uniqe one, because a lot of people wants to have some popular words or names in in it so if somebody already have Microsoft outlook account with that name you will not be able to register your Microsoft outlook acoount. 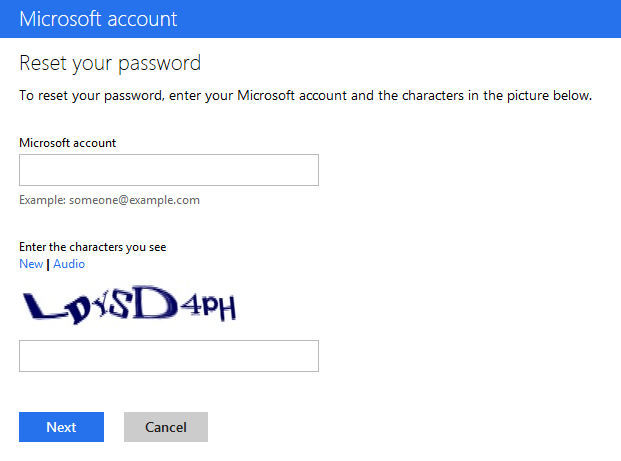 You will enter also that name on signing in MSN Windows Live Messenger. When you click "I accept" you will be forwarded to your online outlook account. Click "Continue to inbox..."
On left upper corner is menu. 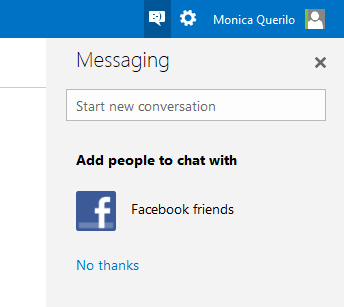 When you click on messenger icon in right top corner Messaging form will open and form here you can send MSN Windows Live Messenger messages and also you can connect to your Facebook account . You just enter your username and password of Facebook page and it will be connected. 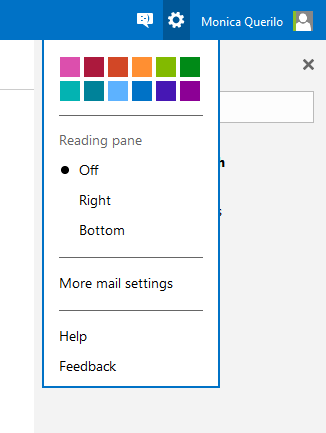 Settings are also on top right and you can change your how your outlook will looks like. When you click on the menu on the left top corner , four items in Windows 8 Metro style will open. 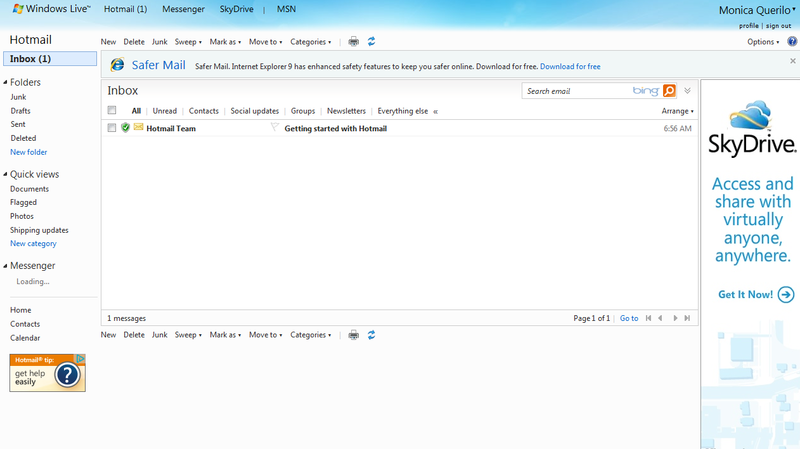 You can choose Mail, People, Calendar and SkyDrive. 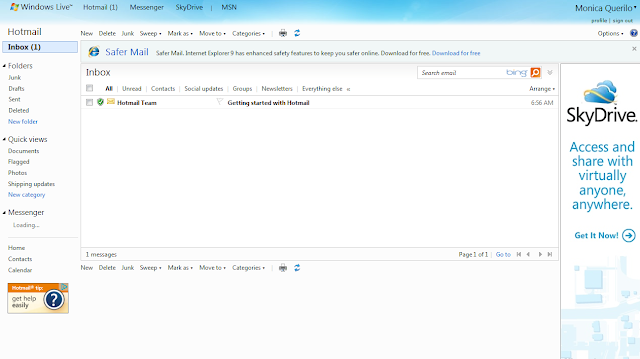 Download the entire Windows Live MSN 2009 easy and use for all time! If you bothered by the fact that any failure in MSN or computer MSN must be downloaded again from the internet. To avoid this you can download ones full MSN and then you can install as much as you want and how many times you want offline and even if the connection is weak. Instructions and a link to download, see HERE. You get an error message 81000306 when you launch MSN Messenger and try to logon. Most likely it's not your fault, there is a problem with the MSN Server. Sometimes this error message alternates with error code 81000314. The MSN server is down, or not unavailable. If it is MSN's problem, do be careful not to make matters worse, for example don't try fixing something that does not need mending, and as a result breaking a perfectly good system. If the server is running, a possibility is that Softpub.dll may have become unregistered. 5) If other people can access the MSN Messenger service, and you are the only one getting Error Code 81000306, then you could look at your anti-virus software. Has anything changed recently? If you are suffering from MSN Error Code 81000306, check that the server is available at Microsoft's end. at: http://messenger.msn.com/Status.aspx. Beware of doing anything to make the problem worse, when it could be the servers fault. A guess, you are typing in the wrong email address. 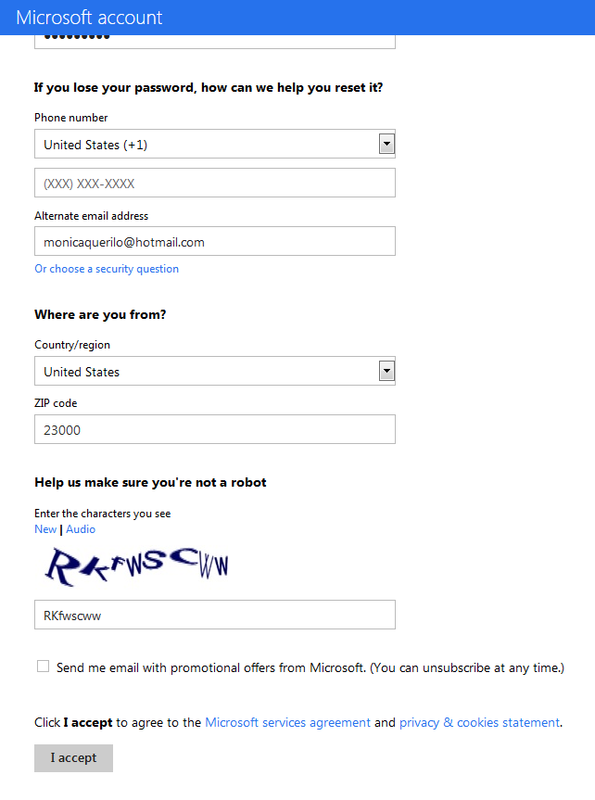 Check the extension, should it be hotmail.com or hotmail.co.xyz? 1) Refer to your registration documentation. 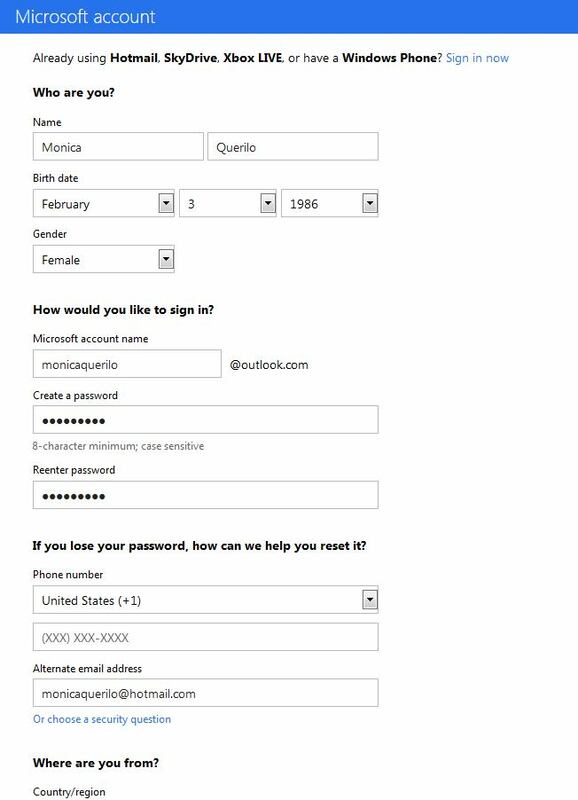 Do you have a confirmation email with your username, which will be an email address? 4) I never like this solution, but sometimes it does the trick: Delete internet temporary files and cookies. Internet Explorer: Tools (menu), Internet Options. 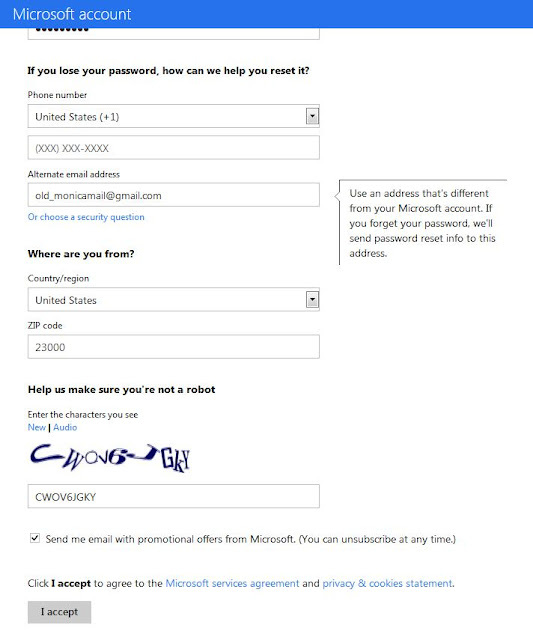 5) The other alternative is that the password is wrong. However, I do believe that would cause a different error number Could the CAPS LOCK be on? Here is the Microsoft site where you can change your password. Double check your the email account for your username. Check that the MSN site really is up and running.